Impairment of postural reflexes, termed postural instability, is difficult to quantify. Clinical assessments such as the pull test suffer issues with reliability and scaling. Here, we present an instrumented version of the pull test to objectively characterize postural responses. Tan, J., Thevathasan, W., McGinley, J., Brown, P., Perera, T. An Instrumented Pull Test to Characterize Postural Responses. J. Vis. Exp. (146), e59309, doi:10.3791/59309 (2019). Impairment of postural reflexes, termed postural instability, is a common and disabling deficit in Parkinson's disease. To assess postural reflexes, clinicians typically employ the pull test to grade corrective responses to a backward perturbation at the shoulders. However, the pull test is prone to issues with reliability and scaling (score/4). Here, we present an instrumented version of the pull test to more precisely quantify postural responses. Akin to the clinical test, pulls are manually administered except pull force is also recorded. Displacements of the trunk and feet are captured by a semi-portable motion tracking system. Raw data represent distance traveled (in millimeter units), making subsequent interpretation and analysis intuitive. The instrumented pull test also detects variabilities influencing pull test administration, such as pull force, thereby identifying and quantifying potential confounds that can be accounted for by statistical techniques. The instrumented pull test could have application in studies seeking to capture early abnormalities in postural responses, track postural instability over time, and detect responses to therapy. Postural reflexes act to maintain balance and upright stance in response to perturbations1. Impairment of these postural responses in disorders such as Parkinson's disease results in postural instability, and commonly leads to falls, reduced walking confidence and diminished quality of life2,3,4. In clinical practice, postural reflexes are typically assessed with the pull test, where an examiner briskly pulls the patient backward at the shoulders and visually grades the response5,6,7,8. Postural instability is usually scored using the Unified Parkinson's Disease Rating Scale (UPDRS) (0 - normal to 4 - severe), as published by the International Movement Disorder Society5. This method has been used extensively in the assessment of individuals with Parkinson's disease but suffers poor reliability and very limited scaling (score/4)6,7,9. Pull test scores often do not correlate with important clinical endpoints such as falls and the integer-based rating lacks sensitivity to detect fine postural changes10,11. Laboratory-based objective measures offer precise information about the nature of balance response by quantifying kinetic (e.g., the center of pressure), kinematic (e.g., joint goniometry/limb displacement) and neurophysiological (e.g., muscle recruitment) endpoints12. These methods may identify abnormalities before postural instability is clinically evident and track changes over time, including responses to treatment13,14. Conventional techniques of dynamic posturography commonly employ moving platforms. Resulting postural responses are quantified using a combination of posturography, electromyography (EMG), and accelerometry12,15,16. However, the bottom-up responses of platform perturbations - which evoke a response like slipping on a wet floor, are fundamentally different from the top-down postural responses of the clinical pull test - as may occur when being bumped in a crowd. Emerging evidence suggests truncal perturbations yield different postural characteristics to those of moving platforms17,18,19. Accordingly, others have attempted truncal perturbations in the laboratory using complex techniques including motors, pulleys, and pendulums15,20,21,22. Methods of measurement are often expensive and inaccessible and comprise of video-based motion capture that requires dedicated space in specialized laboratories20,21. Ideally, an objective method to characterize pull test responses should have excellent psychometric properties, be easy to administer, simple to operate, widely accessible, and portable. This is important to facilitate widespread adoption of the technique as an alternative assessment tool to assess postural responses within research and potentially, clinical settings. The aim of this protocol is to offer researchers a technique for objective assessment of postural responses to the pull test. A semi-portable and widely available electromagnetic motion capture system underpins the technique. The perturbation involves manual pulls that do not require specialized mechanical systems. This method has sufficient sensitivity to detect small differences in postural reaction times and response amplitudes; therefore, it is suited to capturing potential abnormalities rated from normal up to grade 1 postural instability according to the UPDRS (postural instability with unassisted balance recovery)5. This method may also be utilized to explore the effects of therapy on postural instability. The protocol described here is derived from that in Tan et al.23. All methods described were reviewed and approved by the local human research ethics committee at Melbourne Health. Informed consent was obtained from the participant prior to the study. Prepare the electromagnetic motion tracker with 3 miniature motion sensors as per the manufacturer's guidelines. 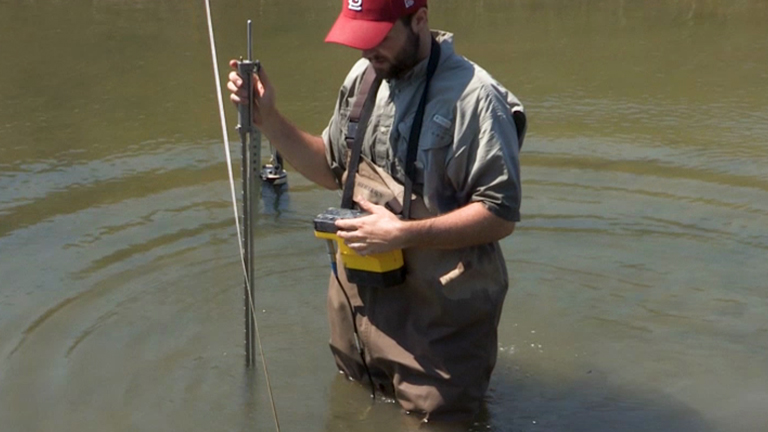 Prior to data collection, ensure each sensor is sampled at a minimum 250 Hz, displacement is measured in millimeter units and rotations (pitch, roll, and yaw) are in degrees. Ensure that all internal filterings are disabled, and the position of the sensors set to reference a static origin (usually the electromagnetic transmitter). Affix a load cell (minimum tension range 100 N, S-type recommended) to the patient harness at shoulder-level using a rope with a minimum diameter of 10 mm. NOTE: The harness system and rope are suitable for use in participants weighing up to 120 kg. Connect the load cell to data acquisition unit (A/D Converter). Connect the trigger output from the data acquisition unit into a trigger input of the motion tracker to ensure synchronized recording. Set data acquisition unit sampling rate to match the motion tracker and disable all filtering. Conduct the experiment in a quiet room to minimize distractions during the assessment. Allow enough space for participants to take several corrective steps to regain balance. NOTE: Patients with Parkinson's disease and retropulsion are known to take 5-6 steps backward during the pull test. Place falls mat on the floor as a precautionary measure. Clean the harness, sensors, and wires with a hospital grade disinfectant wipe before testing each participant. NOTE: Video recording (e.g., using a portable camera on a tripod) of the instrumented pull test procedure is recommended so that any irregularities during data processing can be referenced against the video data of a trial. Identify appropriate participants for study: participants can comprise a range of ages, disease conditions and severity where postural responses are of interest and balance assessment typically employs the clinical pull test. Ensure that participants can stand independently and generate a corrective balance response not requiring assistance to recover (i.e., up to Grade 1 postural instability according to the UPDRS). Exclude any persons with cardiovascular, vestibular, vision and musculoskeletal conditions (including persons requiring foot orthotics or splints), that may impair balance performance unless this is the subject of the investigation, those on contact precautions, and those on medication known to affect balance or attention (e.g., antidepressants, neuroleptics, benzodiazepines, antiepileptics, antiarrhythmics, and diuretics). Have the participant wear comfortable loose clothing on the day of the experiment and remove shoes prior to the pull test procedure. Assist the participant in putting on the customized trunk harness with the load cell. Click the buckles around the chest and waist. Ensure adjustment straps on the harness are tight but comfortable. Do not allow more than 50 mm of slack in the harness when pulling on the rope. In participants with known postural instability, ensure that an assistant is present when the harness is applied while the participant is standing. Attach motion sensors using medical tape to the sternal notch (at the level of the second and third thoracic vertebra), and on the feet at the right and left ankle malleolus. NOTE: Apply the sensors on participants with known postural instability in sitting. All cables must be routed carefully to avoid trip hazards. Ask the participant to stand bare feet, in a comfortable stance (according to the participant's preferred base of support) along vertical and horizontal line markings on the floor. Note the participant's feet position. Ask the participant to also note their own feet position in order to revert to the same position after every pull. Monitor the participant's feet placement after every trial and ask the participant to return to the original feet position if any deviations are observed. Instruct the participant to focus on artwork 1.5 m ahead at the eye level with hands by their side to minimize distractions between pulls. Perform the instrumented pull test in accordance with the clinical pull test guidelines described by the UPDRS5. Explain the test procedure, and let the participant know that stepping is allowed to regain balance following the backward pull. Discourage anticipatory responses such as forward trunk flexion, stiffening in posture or knee flexion prior to the pull. Note these responses if they occur during the experiment. Prior to each pull, ensure the participant is attentive by asking the participant to focus on a picture hanging on the wall. Ensure the participant is standing upright, with eyes open, hands by their side, and their feet placed on the designated markers in a comfortable stance. Stand behind the participant. Apply a brisk pull of sufficient force to generate a trunk and step response via the rope and load cell held perpendicular to the shoulder level of the participant. After each pull ensure the participant returns to the original feet positioning. Reset the position back to designated markers on the floor and repeat 35 times. NOTE: The number of trials can be varied according to the experimental design and clinical population. Allow participants a short rest of 2 min after every 10 trials or as required to reduce the effects of fatigue and ensure attention is focused on the task. Participants can choose to sit or stand. Request that participants refrain from talking in between pulls unless requesting a break or expressing discomfort during the procedure. As an additional safety precaution, ensure that the assessor and assistant are standing with their backs close to a wall while allowing enough room for the participant to take several steps backward. NOTE: The assessor must always be prepared to catch the patient. An assistant is required for safety when participants with known postural instability are assessed. Detach sensors and assist the participant out of the harness following completion of the instrumented pull test procedure. NOTE: Use a suitable data science platform such as MATLAB, R, or Python. Commands shown here are for MATLAB and example code is available as Supplementary File. Import data recorded during step 3.4 into a suitable data science platform: csvread(). Align the motion tracker and load cell data using trigger signals and resample to a higher sampling rate: 1 kHz resample() function if required. High-pass filter all motion tracking and load cell data with a 0.05 Hz cut-off frequency to remove base-line drift: butter() and filtfilt(). Double differentiate the trunk motion tracking displacement data to obtain trunk velocity and acceleration: diff(). Using either the trigger signal or a peak-detection algorithm applied to the load cell data, slice recordings to obtain epochs of each individual pull test trial: findpeaks() function. Detect and reject trials with the anticipatory truncal movement. A forward trunk displacement immediately prior to the pull administration usually presents as a peak at least three standard deviations above the baseline mean of the trunk sensor: std() and mean(). Determine postural reaction time as the difference between the onset of trunk displacement (3 standard deviations above baseline mean) following the pull and the turning point of the trunk velocity curve (indicating the beginning of trunk deceleration): differentiate, diff(), and use zero crossing detector, zcd(). Determine the magnitude of the postural response as the peak deceleration of the trunk: min() or max(). Calculate the step reaction time as the difference between the onset of truncal displacement (as per 4.7) to the initial movement of the stepping limb: 3 standard deviations above the baseline mean. Determine the step response magnitude by calculating the total displacement of the foot in millimeters (mm), from initial foot lift-off to contact of the stepping limb arresting backward retropulsion. Exclude steps less than 50 mm, as the change in the base of support is considered negligible24: min() or max(). Calculate the peak pull force and rate of force development from the load cell: max() for pull; max() and diff() for rate of force. NOTE: The peak pull force indicates the instantaneous maximum force delivered, whereas the force rate is the slope of the force versus time curve indicating how rapidly the force was generated. where Yij is the participant's reaction time or response magnitude for trial i, β0-5 are the fixed effect coefficients, θ0j is the random effect for participant j (random intercept), εij and is the error term. The instrumented pull test distinguished first-trial responses and StartReact effects to a backward perturbation. During the first-trial, step reaction time was slower (first-trial vs. subsequent trials mean difference: 36.9 ms, p = 0.009), and stepping size was larger (first-trial vs. subsequent trials mean difference: 60 mm, p = 0.002) (Table 1). Trunk reaction time and response magnitude remained unchanged. StartReact effects were only present in the trunk to subsequent habituated pulls. A loud auditory stimulus accelerated truncal reaction time (loud vs. normal stimuli mean difference: 10.2 ms, p = 0.002) and increased truncal response magnitude (loud vs. normal stimuli mean difference: 588 mm.s-2, p < 0.001) (Figure 3 and Table 2). Variables contributing to the pull test responses were explored. Notably, examiner peak pull force was found to influence the size of stepping responses (p < 0.001) and trunk reaction times (p < 0.001) (Tables 3 and 4). Participant weight influenced step reaction times (p = 0.008) (Table 3). Otherwise, participant height and weight did not influence results. Figure 1. Set up of instrumented pull test. The instrumented pull test allows an assessor to apply a shoulder-level backward perturbation using a rope and harness (a). The force of the perturbation is recorded using a force gauge (b); the truncal response via a sensor placed at the sternal notch (c); and stepping via sensors on the left and right ankle malleolus (d). The motion tracking system encompasses a processing unit (e) which calculates three-dimensional positions of up to four sensors with respect to an electromagnetic transmitter (f). Auditory stimuli are delivered via headphones.This figure has been modified from23. Please click here to view a larger version of this figure. Figure 2. Data collected from a representative trial from the instrumented pull test. Vertical broken lines indicate markers on the time (t) axis. The onset of pull occurs at marker 0 with subsequent onset of trunk displacement at marker 1. Positive truncal displacement indicates backward movement. The auditory stimulus begins at the falling edge of the sound trigger, within 21 ± 6 ms of peak pull force. The onset of trunk deceleration at marker 2 occurs at the reversal of peak trunk velocity. The postural response (i.e., truncal reaction time) is defined as the difference between markers 2 and 1..This figure has been modified from23. Please click here to view a larger version of this figure. Figure 3. StartReact effects in truncal postural responses. Raw data representative of single trials associated with the normal stimulus at 90 dB (normal), indicated by the grey lines and loud auditory stimulus at 116 dB (loud), indicated by the blue lines. Vertical broken lines indicate markers on the time axis. StartReact is demonstrated by quicker reaction times in trunk velocity to the loud auditory stimulus, indicated by the blue broken vertical line, compared with the normal auditory stimulus, indicated by grey broken vertical line (A). Response magnitude to the postural task is derived from trunk acceleration. Horizontal broken lines indicate markers on the trunk acceleration axis. The largest response magnitude is shown in the loud trial, as indicated by the blue broken horizontal line representing the minimum point of the acceleration curve, compared to the normal trial, represented by the grey broken horizontal line (B). This figure has been modified from23. Please click here to view a larger version of this figure. Table 1. Mean differences (Δ) between the first pull test trial and subsequent trials with 90 dB (normal) or 116 dB (loud) auditory stimuli for step reaction time and response magnitude.This table has been modified from23. Table 2. Mean differences (Δ) between the first pull test trial and subsequent trials with 90 dB (normal) or 116 dB (loud) auditory stimuli for trunk reaction time and response magnitude.This table has been modified from23. Table 3. Coefficient estimates, 95% confidence intervals (CI), and statistical significance of instrumented pull test predictors resulting from linear mixed models for step response.This table has been modified from23. Table 4. Coefficient estimates, 95% confidence intervals (CI), and statistical significance of instrumented pull test predictors resulting from linear mixed models for the truncal response.This table has been modified from23. Supplementary Coding File. Please click here to download this file. Here, we have demonstrated the protocol for instrumentation of the clinical pull test, taking a method widely used in clinical practice and yielding an objective measurement of postural responses in addition to the important aspect of the pull administration. Using semi-portable motion tracking, this method offers a means of measurement that is more accessible compared to conventional laboratory techniques28. Using this method, researchers can explore characteristics of postural responses to a top-down perturbation across populations of varying ages and conditions. While the protocol was used successfully, several limitations should be noted. Motion tracking detects net movement rather than the onset of muscle recruitment, commonly measured by EMG29,30,31. If desired, EMG (e.g., measured from muscles including tibialis anterior, soleus, hamstrings, quadriceps, rectus abdominis and lumbar paraspinals) could be integrated into the protocol with relative ease. The motion sensors we employed are connected by wires to the base unit. These wires are of sufficient length in the laboratory to record pull test kinematics, yet a wireless system would be more practical particularly in a clinical setting. Further validity and reliability testing in cohorts of different disease states and severity is required before this method can find credibility as a standardized assessment tool to assess postural responses scored up to a grade 1 according to the UPDRS (postural instability with unassisted balance recovery)5. Electromagnetic motion tracking is relatively inexpensive and semi-portable compared to other solutions which report displacement data21,32,33.Recording of displacement in millimeter units is crucial to the simplicity of the technique as it negates the requirement for complex signal processing, so the data can be intuitively comprehended. Other commonly used techniques such as accelerometry cannot be easily converted to displacement without the use of adequate sensor-fusion techniques to remove several confounds (gravitational artifact, drift over time, calibration error)28,34,35. Critical steps were discerned in this protocol to ensure accurate collection of data. Importantly, we defined postural reaction time in the instrumented pull test by the onset of truncal displacement, rather than the onset of the examiner-initiated pull. This was crucial to exclude any movement of the harness and rope at the time of the pull that contributes to the response latency. In previous work, the peak acceleration of postural responses occurred earlier, and with larger amplitudes in the upper body compared to the sacrum in response to a truncal perturbation17. The pull of non-standardized force was elicited manually, similarly to the clinical pull test. Stepping is defined as the foot moving past the stance foot in the backward direction, excluding movement in any other direction. We found peak force significantly affected step and trunk responses. Recording of force is therefore imperative to the methodology and results can account for pull force by using mixed effect models. Depending on the load cell specifications a pre-amplifier and separate power supply may be required. Use the calibration curve supplied by the manufacturer to convert the recorded voltage to pull force (Newtons). The trigger may also be used to time the delivery of auditory or visual stimuli for further characterization of balance mechanisms. When 35 trials are performed, the instrumented pull test procedure takes approximately 20 minutes to complete. Users of this protocol will need to determine if timeframes required for the experiment are appropriate compared to their usual methods of assessing postural instability. During the task, participants are instructed to focus on the picture, as attention is known to attenuate with repeated exposure to a threat to balance control36. Attention to a postural task is associated with increased conscious monitoring of posture, and the corresponding decrease in amplitude of postural displacements37. During testing, the safety of participants and potential falls risk to both assessor and patient are of imperative concern. Additional safety precautions include the use of an assistant for patients with known postural instability and proximity to a wall to safeguard the assessor from falling together with the participant9. The instrumented pull test has demonstrated the capability to detect small changes in response latency of postural responses. In the representative results, we delivered auditory stimuli concurrent with the perturbation to assess for acceleration in reaction time that occurs with loud (116 dB) compared with lesser intensity (90 dB) stimuli, known as the StartReact effect25,38. We were able to detect an average difference in truncal response latency of approximately 10 ms with the instrumented pull test protocol in a cohort of 33 participants23. Acceleration of such movement onsets to the StartReact effect typically occur with a magnitude of less than 20 ms using EMG15. Differences in stepping latency were also detected in first trial responses, with larger step responses. This is consistent with the greater destabilization found in 'first-trial effects' using moving platforms39,40. 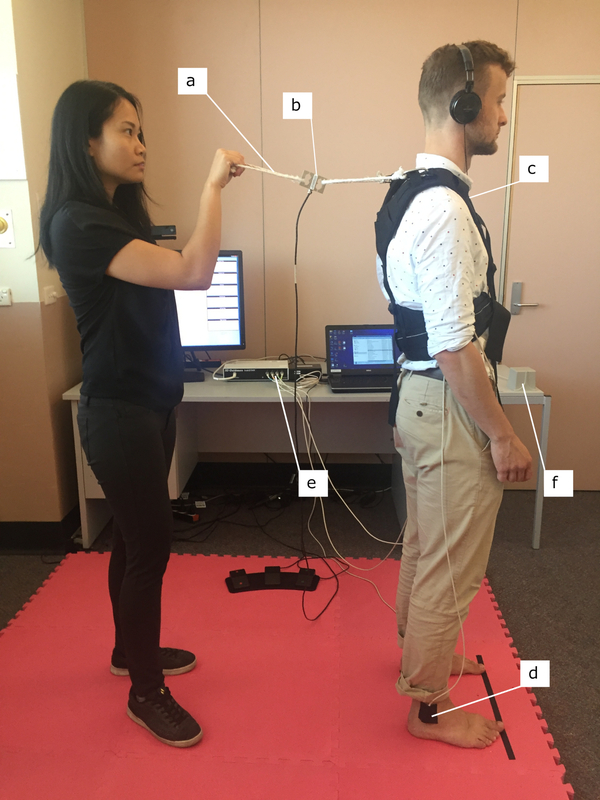 This method described in this manuscript has demonstrated the capability of the instrumented pull test to provide precise quantification of postural responses in response to the typically employed clinical pull test. At present, the instrumented pull test is intended as an alternative method to assess postural responses in the research setting. Further work in reliability and validity is required before its use in the clinic. The number of instrumented pull test trials can be adjusted at the user's discretion dependant on statistical power calculations. To increase the participant's comfort during testing, particularly with females, a modified harness which fastens from behind could be considered in a future version of the instrumented pull test. Further research is required to fully explore these responses in patient populations with balance abnormalities (up to grade 1 postural instability according to the UPDRS) to investigate effects of therapy and elucidate mechanisms contributing to postural instability. No conflicts of interest, financial or otherwise, are declared by the authors. We thank Angus Begg (The Bionics Institute) for his assistance in the video protocol. We acknowledge Dr. Sue Finch (Statistical Consulting Centre and Melbourne Statistical Consulting Platform, University of Melbourne) who provided statistical support. This work was supported by the funding through the National Health and Medical Research Council (1066565), the Victorian Lions Foundation, and The Victorian Government's Operational Infrastructure Support Program. Shemmell, J. Interactions between stretch and startle reflexes produce task-appropriate rapid postural reactions. Frontiers in Integrative Neuroscience. 9, (2015). Kerr, G. K., et al. Predictors of future falls in Parkinson disease. Neurology. 75, (2), 116-124 (2010). Latt, M. D., Lord, S. R., Morris, J. G. L., Fung, V. S. C. Clinical and physiological assessments for elucidating falls risk in Parkinson's disease. Movement disorders: official journal of the Movement Disorder Society. 24, (9), 1280-1289 (2009). Foreman, K. B., Addison, O., Kim, H. S., Dibble, L. E. Testing balance and fall risk in persons with Parkinson disease, an argument for ecologically valid testing. Parkinsonism & Related Disorders. 17, (3), 166-171 (2011). Fahn, S. Recent Developments in Parkinson's Disease. Macmillan Healthcare Information. Florham Park, NJ. 153-163 (1987). Hunt, A. L., Sethi, K. D. The pull test: a history. Movement disorders: official journal of the Movement Disorder Society. 21, (7), 894-899 (2006). Visser, M., et al. Clinical tests for the evaluation of postural instability in patients with parkinson's disease. Archives of Physical Medicine and Rehabilitation. 84, (11), 1669-1674 (2003). Jacobs, J. V., Horak, F. B., Van Tran, K., Nutt, J. G. An alternative clinical postural stability test for patients with Parkinson's disease. Journal of Neurology. 253, (11), 1404-1413 (2006). Nonnekes, J., Goselink, R., Weerdesteyn, V., Bloem, B. R. The retropulsion test: a good evaluation of postural instability in Parkinson's disease? Journal of Parkinson's Disease. 5, (1), 43-47 (2015). Bloem, B. R., Beckley, D. J., van Hilten, B. J., Roos, R. A. C. Clinimetrics of postural instability in Parkinson's disease. Journal of Neurology. 245, (10), 669-673 (1998). Thevathasan, W., et al. Pedunculopontine nucleus deep brain stimulation in Parkinson's disease: A clinical review. Movement Disorders. 33, (1), 10-20 (2018). Visser, J. E., Carpenter, M. G., van der Kooij, H., Bloem, B. R. The clinical utility of posturography. Clinical Neurophysiology. 119, (11), 2424-2436 (2008). McVey, M. A., et al. Early biomechanical markers of postural instability in Parkinson's disease. Gait and Posture. 30, (4), 538-542 (2009). Mancini, M., et al. Trunk accelerometry reveals postural instability in untreated Parkinson's disease. Parkinsonism & Related Disorders. 17, (7), 557-562 (2011). Nonnekes, J., et al. Are postural responses to backward and forward perturbations processed by different neural circuits? Neuroscience. 245, 109-120 (2013). Horak, F. B., Dimitrova, D., Nutt, J. G. Direction-specific postural instability in subjects with Parkinson's disease. Experimental Neurology. 193, (2), 504-521 (2005). Colebatch, J. G., Govender, S., Dennis, D. L. Postural responses to anterior and posterior perturbations applied to the upper trunk of standing human subjects. Experimental Brain Research. 234, 367-376 (2016). Graus, S., Govender, S., Colebatch, J. G. A postural reflex evoked by brief axial accelerations. Experimental Brain Research. 228, (1), 73-85 (2013). Govender, S., Dennis, D. L., Colebatch, J. G. Axially evoked postural reflexes: influence of task. Experimental Brain Research. 233, 215-228 (2015). Smith, B. A., Carlson-Kuhta, P., Horak, F. B. Consistency in Administration and Response for the Backward Push and Release Test: A Clinical Assessment of Postural Responses: Consistency of Push and Release Test. Physiotherapy Research International. 21, (1), 36-46 (2016). Di Giulio, I., et al. Maintaining balance against force perturbations: impaired mechanisms unresponsive to levodopa in Parkinson's disease. Journal of Neurophysiology. (2016). Nonnekes, J., de Kam, D., Geurts, A. C. H., Weerdesteyn, V., Bloem, B. R. Unraveling the mechanisms underlying postural instability in Parkinson's disease using dynamic posturography. Expert Review of Neurotherapeutics. 13, (12), 1303-1308 (2013). Tan, J. L., et al. Neurophysiological analysis of the clinical pull test. Journal of Neurophysiology. (2018). McVey, M. A., et al. The effect of moderate Parkinson's disease on compensatory backwards stepping. Gait and Posture. 38, (4), 800-805 (2013). Valls-Sole, J., et al. Reaction time and acoustic startle in normal human subjects. Neuroscience Letters. 195, (2), 97-100 (1995). Carlsen, A. N., Maslovat, D., Lam, M. Y., Chua, R., Franks, I. M. Considerations for the use of a startling acoustic stimulus in studies of motor preparation in humans. Neuroscience and Biobehavioral Reviews. 35, (3), 366-376 (2011). Nanhoe-Mahabier, W., et al. First trial reactions and habituation rates over successive balance perturbations in Parkinson's disease. Neuroscience. 217, 123-129 (2012). Aminian, K., Najafi, B. Capturing human motion using body-fixed sensors: outdoor measurement and clinical applications. Computer animation and virtual worlds. 15, (2), 79-94 (2004). De Luca, C. J. The use of surface electromyography in biomechanics. Journal of Applied Biomechanics. 13, (2), 135-163 (1997). Horak, F. B., Nashner, L. M. Central programming of postural movements: adaptation to altered support-surface configurations. Journal of Neurophysiology. 55, (6), 1369-1381 (1986). Saito, H., Yamanaka, M., Kasahara, S., Fukushima, J. Relationship between improvements in motor performance and changes in anticipatory postural adjustments during whole-body reaching training. Human Movement Science. 37, 69-86 (2014). Kam, D. D., et al. Dopaminergic medication does not improve stepping responses following backward and forward balance perturbations in patients with Parkinson's disease. Journal of Neurology. 261, (12), 2330-2337 (2014). Peterson, D. S., Horak, F. B. The Effect of Levodopa on Improvements in Protective Stepping in People With Parkinson's Disease. Neurorehabilitation and Neural Repair. 30, (10), 931-940 (2016). Haubenberger, D., et al. Transducer-based evaluation of tremor. Movement Disorders. 31, (9), 1327-1336 (2016). Elble, R., et al. Task force report: scales for screening and evaluating tremor: critique and recommendations. Movement disorders: official journal of the Movement Disorder Society. 28, (13), 1793-1800 (2013). Adkin, A. L., Carpenter, M. G. New insights on emotional contributions to human postural control. Frontiers in Neurology. 9, 789 (2018). Huffman, J. L., Horslen, B., Carpenter, M., Adkin, A. L. Does increased postural threat lead to more conscious control of posture? Gait and Posture. 30, (4), 528-532 (2009). Valls-Sole, J., Rothwell, J. C., Goulart, F., Cossu, G., Munoz, E. Patterned ballistic movements triggered by a startle in healthy humans. The Journal of Physiology. 516, (Pt 3), 931-938 (1999). Campbell, A. D., Squair, J. W., Chua, R., Inglis, J. T., Carpenter, M. G. First trial and StartReact effects induced by balance perturbations to upright stance. Journal of Neurophysiology. 110, (9), 2236-2245 (2013). Oude Nijhuis, L. B., Allum, J. H. J., Valls-Solé, J., Overeem, S., Bloem, B. R. First trial postural reactions to unexpected balance disturbances: a comparison with the acoustic startle reaction. Journal of Neurophysiology. 104, (5), 2704-2712 (2010).